We posted votes that took place for a week and we asked that you all participate. Well here are the results and findings from the votes. Seems that outside of Topps and Panini there is no other competition. Your Favorite Card Company Is? Card Company With The Best Bang (or Mojo) for your Buck(s)? Card Company with the Best Use Of Social Media? Card Company With The Best Overall Product? Card Company With The Best Promo's? Card Company With The Best Customer Service? So I guess this leads us to ask..what should the other two companies that we put on this list (Upper Deck and Press Pass) do to fix things and gain more votes? And why didn't you vote on them? It is in our opinion that Press Pass was low voted for because of their lack of licensing. They have pretty good customer service and they run some great promos on their Facebook page however don't really use Twitter to their advantage. As for Upper Deck who might have at one point dominated this voting the lack of pro licensing, the customer service being not as strong as it used to be, and not as many giveaways as the top two companies could be some of the reasons. Their products still seem to be strong. But this is only our opinion and we would like to hear yours as well! Next up, we are taking a poll vote on why you buy what you buy with another 6 or so questions. Hopefully our opinions and polls will help the card companies with what they need to work on. This poll will be taken down the road and we will keep you informed. Your participation is much welcomed!! This is the box that we won from Topps. Not only is it one of my personal favorites...I know I seem to use that term a lot..but its really truly used here. Just such a great product and 2012 may be the best ever!! Look for (1) Autograph Card Per Box! 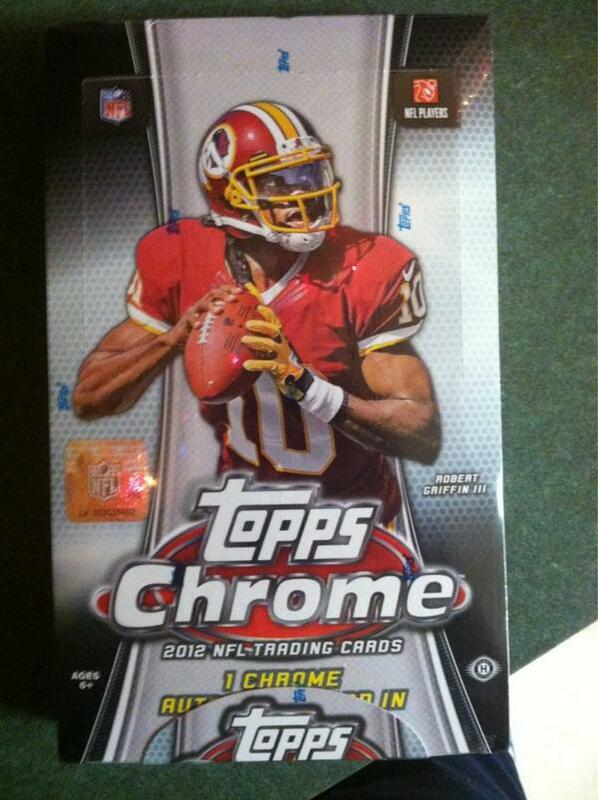 Around $105 a Hobby box but watch for that number to go up as the popularity does! BASE CARDS: What can I say..I love em! Anything with a chrome finish..wow. You would think with my love of chrome I would love cars as well..but to be honest I can't even do an oil change ;) This is something I would put a base set together of. The rookie cards are my most sought after and my favorite. Our box proved to be very rookieful. On average we believe you are supposed to get one rookie per pack. We got over 35 rookies in this box! All of the great ones except Luck and Richardson. It would take a lot of boxes to get a base set. You don't get many base cards, though no duplicates, you still don't get enough with all of the parallels and inserts you get in a box. INSERTS: Loaded with inserts and tons of refractors to choose from this product has a lot to chase. And with all of them having parallels..you can put together many different variation sets. Fun chase to say the least. And they look real nice! AUTOGRAPH CARDS:Only one hit per box..and this was it. Though not the best player..gotta play behind Peyton Manning for the next 5 years before even getting a shot..this was a tough low numbered pull # to 25. These usually do well on the market in terms of sales. Recently bought this lot off from eBay. Was a mixture of sports and came with 2 jersey cards. Most importantly some of the money paid for the lot went to a good cause so couldn't go wrong with it. I like to help out as many causes as I can whether in big or little ways. And the cards were just a bonus. This was the best of the best. John Kruk, Dave Righetti, Harold Baines and Kirk Gibson rookies. Overall didn't think it was a bad buy. With some of the proceeds going to a great cause and the cost of the lot around $20 I would probably take the chance again. You never know what you can find. My favorite find out of this lot has to be the Kirk Gibson rookie. What were your thoughts on my lot pickup? Do you take chances on these types of eBay lots sometimes? 5 most EPIC cards you have got to own! Why this was chosen...Not only is it a greatly designed card, it has been on the Beckett hot list multiple times as the most wanted and most valuable rookie card of Jeter. These cards are also hard to find in great condition due to the foil cardboard. And of course the player is another reason. Not bad to have a top rookie card of a future Hall of Fame Shortstop who has won multiple World Series Championships among other awards. An honest hitter who didn't use steroids to put up big numbers. Why this was chosen... This card is called by us the most iconic card in Upper Deck history and its also the one that started it all for Upper Deck. When I was young, you didn't have a collection without this card. And it didn't matter even if you didn't collect baseball cards... this was the card you had to have. Sales and value have dropped due to his injury prone ending to his career, but he is still way up on the all-time home run list, probably if not been injured conquered 3,000 hits and did it the honest way during a time of huge steroid use. Why this was chosen... Once again. "The Great One" A Hall Of Fame player and by far the best hockey player of all-time. He is the leading pointscorer in NHL history who has the most assists than any other player has points. Not to mention that he is the only NHL player to total over 200 points in one season and he not only did that once..he did it FOUR times!! This is a must have for any hockey collector and collector in general. His name is well known and this card is still very popular now. Just go check out the buying prices for it. Why this was chosen... You would be crazy to say you don't want this rookie card. I was a Knicks fan and seeing Jordan play against them and winning multiple championships made me cringe..but my wanting of owning this card has never changed. Michael Jordan was one crazy man on the court and you knew you were in trouble if his tongue was hanging out...that mean you were or was about to be dunked on. He has stats, championships and play that has never or will never be seen again. Sorry LeBron. And the number one.....the one and only 1952 Mickey Mantle card. It doesn't get and more EPIC than this card. And it doesn't need an explanation why its at the top..just look at it and try not to drool and want it for your collection. You would have to go get yourself checked if you don't. What do you think of our top 5? Is there one you would have substituted? Is there one you would have moved up or down? While everyone else is running out to the local shopping centers looking for the best deals...I sit back relaxed knowing I got done shopping way ahead of time. I shop all throughout the year to avoid going to fight someone for that last Xbox game or last Barbie on the shelf just because its a few dollars cheaper. But while I am sitting here...I am however enjoying the pics I have seen all over Twitter for Panini America's Black Friday Extravaganza! So I couldn't just leave an event so big like this alone. I have to show some pics and give my thoughts on the cards. Panini's Black Friday set is of 50 cards ranging from multiple sports. I really like the silver cardboard look of the base cards. For all of you who read this blog on daily or weekly basis..you know I have got to get my hands on the Super Bowl Memorabilia cards. Being a Giants fan I was hugely impressed by the design and very excited that Panini included these into the memorabilia part of the promo cards. Early asking prices for these cards range from $60-$200 for unsigned. I can only imagine what some of the signed ones will go for. Everyone knows how RG3 did on Thanksgiving so finding an insert card like this in a pack is not a bad thing at all.Most of these on the bay are going for $10 or more. These bad boys..a combination of the cracked ice insert that is signed. These cards are beautiful signed or not. These are going for $200+ on eBay signed right now. As a collector this is an awesome promotion that Panini puts on and I hope they continue to do it for years. And for those of us who can't make it to a card shop or don't have one..don't worry!! There is an online component of this promo! Just go to iCollectPanini.com and find these packs there! Just make sure you hurry...these are moving faster off the shelves than a Tickle Me Elmo!! Overall, this years promo should blow away last years numbers as Panini has improved an already successful promo. I stand behind this promo like the other Panini ones. I like how they are taking collecting and kicking it up a notch! Not only awarding us with these tremendous cards as a FREE side bonus for purchasing Panini products from LCS' (which also helps them bring in a lot more customers) and from the iCollectPanini.com site but for always looking out for us as their #1 commitment and not scared to try new things. Thanks Panini! Oh, and if you have any pics of these cards to share..please feel free to email us (sportcardcollectors@hotmail.com), or post them on our Facebook page or find us on Twitter!! The one thing that I like, is getting a bat piece instead of a jersey card. Seems like companies have increased the amount of jersey cards they do over the amount of other items. So when finding something other than a jersey card...you gotta get excited! Recently broke 8 Hobby packs of 2012 Topps Update Baseball 2012. Not a bad break. 4 numbered ones to 2012. Kimbrel being our best hit. 4 numbered ones in 8 packs isn't bad. 1:2 odds. A few good rookies. This break got a three for what you pay and what you get in return for value. There wasn't really a big hit here that would give it an even higher number. First and foremost, I am thankful for a great family. I am very blessed to say the least. Thats what matters most. Secondly, I am thankful for having this blog and its on and off success so far. When I first started to blog..I didn't know what to expect. Would it make it? Would my opinions matter? Would anybody read it? I would say for the most part I am pretty happy with the results as a rookie blogger. Hoping my 19 years of collecting gives you guys some useful insight and tips. If not, I have failed you as a blogger. Thirdly, I am thankful for Panini America and for taking a chance and sponsoring this blog. Without them, we wouldn't have the amazing giveaways and more! Fourth, I am thankful for some amazing fans of the blog.Without you guys...this blog wouldn't survive. Need you here daily to enjoy reading stories, reviews, card posts and more. And sharing your thoughts and most of all for putting in great efforts like you did for our Panini Player Of The Day promo! Here is a little gallery and shoutout to you guys! And to those of you I don't have a pic of to share on here...a big thanks and shoutout to you guys as well!! So for Thanksgiving today, eat your turkey til you are stuffed, watch football til your hearts content..but most importantly enjoy time with your family today and say thanks to them. Hoping all of you have a great Thanksgiving...Sport Card Collectors! Thought I would share my All-Time Top 5 Favorite Panini Brands that I buy year in and year out!! There were so many to choose from. Two others that I get year in and year out but missed the cut by a tiny bit are Prestige and Rookies and Stars. And they didn't miss the cut by much. They were probably 5a and 5b. The list starts from the bottom to the top favorite! This product has 2 Autographs & 2 Memorabilia Cards per box which is a start of why its great. But every year Panini improves this product. This year the inclusion of Acetate cards made this a very hot product and a product that now is even more tempting!! The base cards are always on silver cardboard and look nice. Once again..always starts with a nice base card for me!! The biggest thing for me about this product is its RPM's. Which is Rookie Premier Materials. 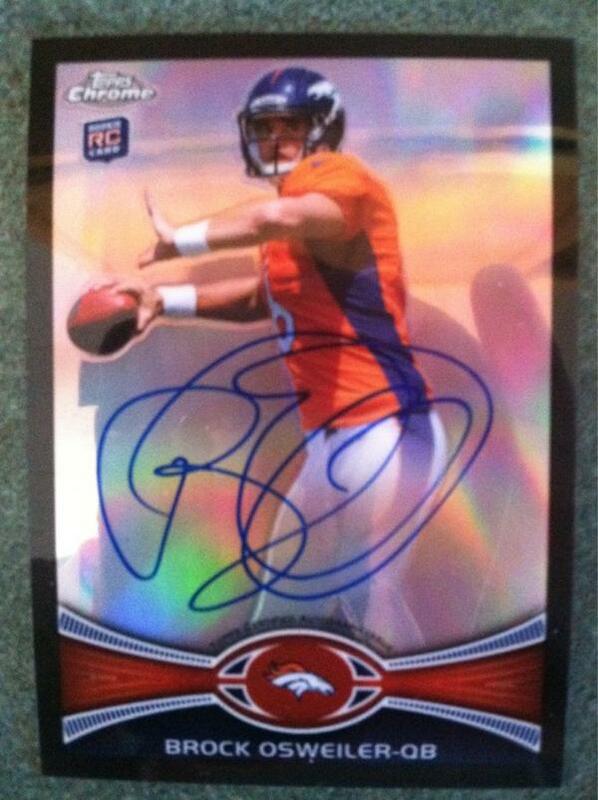 Love the rookie cards with pieces of jersey and footballs and sometimes more and sometimes autographed. In an era of collecting where rookies are tops you need to find the best looking rookie cards and this product has them! Once again another product with 4 hits but they are most of the time worth it. Like I put in a recent review, really silver base cards and despite seeing fingerprints sometimes on them..they can be easily wiped off. The mirror parallels are Panini's version of a refractor and they look really nice on that silver cardboard. They also have mirror parallels of some of the jersey cards in the product and those make regular jersey cards look like trash in comparison. Just stunning! The rookie Freshman Fabric have always been very popular with a jersey piece and autograph. And you can't talk about this product without at least mentioning Fabric of the Game. Diecut team names embedded with jersey card. Some of the best jersey cards out there. This is number three because of looks and design of the overall product. Panini brought back one of my favorites from the late 90's and added a Panini twist to it while also staying with the dufex technology. You top that with parallels of the base cards, a video trading card that you could possibly find, 6 hits in a box, auto/jersey rookie cards with a nice look to them and memorabilia from past legends and you got a winner! Die cuts, auto rookie silhouettes, parallels, nice base set, stunning memorabilia cards and autographs, may I go on?? Panini put this one right at the top last year with the Rookie Silhouette inclusion. A rookie card that has a nice swatch or patch sihouetted in the background and is also autographed. There are NO other rookie cards like it on the market! And with 2012 and the addition of Legendary Silhouettes Signatures too and the return of Panini's Choice Awards..this product only continues to get stronger! Do you have any favorites and what? Do you agree with my list or would you have put them in a different order?